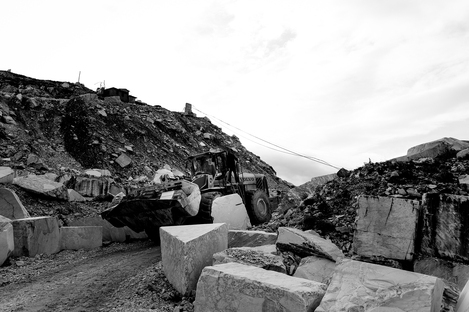 The activity of the quarries in Versilia has completely changed the landscape, and has tied the lives of so many men to marble quarrying. The activity of the quarries in Versilia has completely changed the landscape, and has tied the lives of so many men to marble quarrying. Alessandro Cinque's work gives us the opportunity to explore the Cervaiole quarry, daily arena for a close relationship between identity, technology and territory. Young Tuscan photographer Alessandro Cinque takes us on journey through the historical quarry of Cervaiole, on Monte Altissimo. It is here that in the early 1800s, Jean Baptiste Alexandre Henraux started up the whole chain of quarrying processing and transporting again, after it had been left abandoned and unused for so many years. Since then the prestige tied to the raw material and to the quarrying technique still remains immense. From this very special location, 1300 above sea level, you find yourself face to face with a unique landscape: surrounded by the Apuan Alps, your eyes sweep from the mountains to the sea, in a single, wide visual frame. A fascinating position that is also hard to get to, which preserves its nature as a bare, adverse place even though it has been transformed by the hand of man. Alessandro Cinque's photographs immortalise this transformation, which has dug into the side of the mountain albino patterns, formed of smooth horizontal and vertical planes. In a play of light and shadows, their majesty is such as to give you the impression that this landscape has always looked like this. You can still feel the wild nature, in the veins of the marble, in the low temperatures and in the snow that doesn't easily melt, even in Spring. But it's not just the mountain that has been transformed. Through this tradecraft, the men of Versilia have tied their lives to techniques and traditions whose roots go down very deeply. It goes beyond just exploitation for economic reasons, man and stone have lived side by side for centuries, mutually influencing each other. 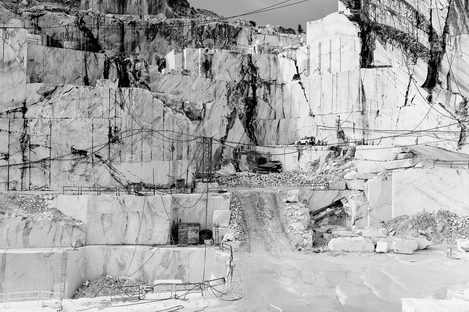 Alessandro Cinque's work explores this dual personality of the Cervaiole quarry. While all the photographs focus on the beauty and on the strength of this transformed landscape, the last one in the collection is a memorandum. It portrays a quarry worker, as if the photographer wanted to wrench us back to the real world, to remind us that this territory would not be as it is without the action of humans and their traditions. Given the importance of those traditions, the company has planned a project to build the Henraux Cultural Centre. The goal is to train high level professionals and exhibit works already in the collection alongside others to be created. This confirms the awareness that this land has both a natural and a human identity, constantly engaging with the territory and the generations who live there.